It has been another remarkable year for cinema. With this in mind, I gladly enclose my list of the sixty greatest films of 2017. The criteria I utilized when putting this composition together is that every picture had a U.S. release date in the aforementioned year. Please note that I have yet to see The Shape of Water and The Disaster Artist. Hence, the exclusion of these features from this article. Yet, make sure to return to this page. I will be adding to this piece once I have had the chance to view these pictures myself. Enjoy! Directors: John Campopiano, Justin White. Directors: Bonni Cohen, Jon Shenk. Directors: Jon Nguyen, Rick Barnes, Olivia Neergaard-Holm. Directors: Dorota Kobiela, Hugh Welchman. Directors: Firas Fayyad, Steen Johanessen, Hasan Kattan. Cannibal Farm (2017), the second feature from writer-director Charlie Steeds, is dripping with obvious influence. This is most readily discrnible from the on-going Texas Chain Saw Massacre series. It is visible in its unflinchingly grim subject matter. Particularly, the taboo consumption stated outright in the title of Steeds’ endeavor. Such a similarity is also evident in the general appearance of the murderous madman glimpsed on the eye-catching cover art. This image is also slyly captured in myriad forms throughout the course of the 101-minute undertaking itself. 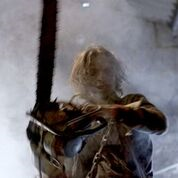 Furthermore, Steeds’ construction shares the same grindhouse style and gritty artistry that graced Tobe Hooper’s groundbreaking initial installment of the afore-said succession, The Texas Chain Saw Massacre (1974). Moreover, the now traditional central location of the action in both films is an isolated farmhouse. Not to mention, once the tension begins in each picture there is simply no letup. This is until the relatively brief end credits roll. In the case of Steeds’ enterprise, this perpetual concentration commences at the half-hour mark. This is in a sequence that is as surprising as it is memorable. These resemblances would’ve been enough to garner the interest of many genre enthusiasts. Regardless, Steeds doesn’t rely solely on this inspiration to propel his own material. Instead, he uses the strained relationships that are heavily focused on in the first act to culminate a concern for our protagonists that genuinely works. It also becomes the pulpit for an array of terrific lead performances. Chiefly, Barrington De La Roche as the notorious Hunt Hansen and Kate Marie Davies as our compelling heroine, Jessica Harver. Unlike various other terror-evoking showcases, these articles aren’t dropped as soon as our protagonists find themselves in a variety of potentially lethal encounters. Steeds never forgets these dramatic touches. They are addressed throughout the runtime to brilliant effect. This makes the intensity at hand evermore admirable, incessant and layered. It also gives way to the best twist in the entire fabrication. It arrives at the midway point. This bit is a masterclass in getting audience members to share the perspective of some of the leads. Set in the British countryside, the story revolves around the Harver family. They begin the narrative in an effort at bonding and being able to overcome their past differences. This is through the time-honored cinematic tradition of a camping trip. After an unseen menace destroys the outdoors spot where the clan was hoping to stay for the night, they seek aid in a nearby homestead. Soon the tranquil ambitions of the Harvers are erected into an all-out nightmare. This is as they come face to face with Hansen (who receives his last name from the Icelandic-born actor that played Leatherface in Hooper’s masterpiece, Gunnar Hansen) and his deformed son. This solid, if standard in retrospect, narrative foundation incorporates some interesting detachments from Hooper’s formula. For instance, the mobility of a variety of Steeds’ on-screen personas are limited to cages. This detail assists in making Cannibal Farm a taut, claustrophobic experience. Though this restraint in movement could’ve easily become repetitive in less imaginative hands, Steeds brings a string of uniquely dangerous situations for the encapsulated. Thus, the entertainment level of the piece never wavers. Steeds even sneaks in a few ideas in this arena that can be aligned to any of the eight Saw (2004-present) movies. One of the most haunting of these moments, which occurs in the last twenty minutes of the exertion, brilliantly calls to mind the iconic furnace scene in Saw II (2005). Such an attribute is also a testament to the quality of Steeds’ character-oriented, brutal and inventive screenplay. The confidently paced and sharply structured script defies the stalk-and-slash expectations and clichés of the sub-category at nearly every turn. Such is most noteworthy in the execution of the unexpected and satisfying finale. This makes for an appropriate bookend to an exercise that commences with a jarring and assuredly attention-garnering (if too reliant on slow-motion shots) prologue. This configuration runs approximately five minutes. Steeds’ behind the lens labors are just as potent. This can also be spoken of his editing. Furthermore, the cinematography from Michael Lloyd helps parallel the original Texas Chain Saw Massacre in another facet altogether. This is in its raw, yet technically magnificent, veneer. Correspondingly, Sam Benjafield’s music is marvelous and atmospheric. Additionally, the previously undeclared enactments are deft. Sam Lane makes an incredible impression during his sparse turn as The Boy with The Melted Face. David Lenik as Toby and Rowena Bentley as Katherine Harver are equally enjoyable in their respective depictions. Toby-Wynn Davies is superb as Wesley Wallace. Peter Cosgrove is commanding as Everett Blackheart. Continuously, Joe Street’s representation of Kurt Daniels and Dylan Curtis’ embodiment of Sam Harver are involving and skillful. Also known as Escape from Cannibal Farm, Steeds’ latest flick is a surefire triumph. The Dark Temple Motion Pictures production isn’t overly reliant on gore. Still, bystanders will leave the affair feeling as if they have seen an endless array of graphically violent arrangements. Such is a testament to the uncompromising effectiveness of Steeds’ craftsmanship. This is especially true of his capacity to fashion well-done and credible scares. It is also one of the more nuanced correlations to Hooper’s low-budget gem. Because of the above reasons, fans of boogeymen new and old will certainly want to check out this instant classic. It will be released on Video on Demand via High Octane Pictures on January 2nd, 2018. Included below are A Word of Dreams’ twenty-five favorite rap albums of 2017. The artist of the work proceeds the title of the project. Enjoy! No_One Ever Really Dies – N.E.R.D. Included below are A Word of Dreams’ fifteen favorite short films of 2017. The title of the work is proceeded by the name of the director or directors of the project. Enjoy!